I am using some gorgeous Paper Temptress papers and some wonderful Lace that I got while in Istanbul. The image and sentiment are printed out on Neenah Solar White. The gorgeous background paper is Mica/Metallic that is a lush purple color called Ruby. 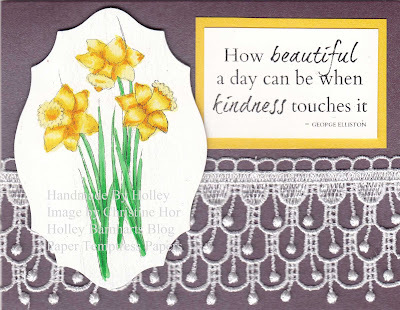 The sparkly yellow cardstock under the sentiment is called Mangue Sparkle. It’s just stunning and you can see the mica flecks. I truly LOVE Daffodils and unfortunately they do now grow well here in California…they need a cold winter to flower in the spring and we don’t get those cold winters here….otherwise I would have a whole lawn of daffodils LOL..I really do like them that much…fabulous ribbon too!